The church chair needs of today's worship facilities are evolving, just as churches today are changing. How can you wisely evaluate seating options to ensure your investment will support your congregation and its needs for years to come? Since the worship space is central to the mission of your church, its seating needs should be considered first. For centuries, wooden pews were the only option for church seating. Anything else didn't "feel" like a church. The United States was following the architectural traditions of immigrant ancestors, starting with the Pilgrims of the 1600s. Wooden pews represented tradition, strength, and stability. Early Puritan preachers delivering fire-and-brimstone sermons were not concerned about their congregation's earthly comforts. Only in recent years have padded, theater-style chairs come into prominence, as many large churches are adopting the furnishings and audio-visual capabilities of performing arts centers. "People are not put off by theater seats in church like they might have been even a decade ago," said architect Bill Chegwidden, AIA, president of CDH Partners in Atlanta. His firm sees an approximate 50/50 split between pews and theater seats in their church projects. Some churches have both – theater seats in the main worship area and wooden pews or chairs in the chapel or more intimate space, giving those smaller areas a more traditional feel. Rather than regional or denominational variations, Chegwidden believes the differences are mostly philosophical, with the seating decision made fairly early in the design process. Architect Butch Wolfe, AIA, IIDA, principal with McGehee Nicholson Burke Architects in Memphis, Tennessee, also recommends that a church select seating that best accommodates their style of worship. "If people move around often, such as processing up to the altar for confession or communion, I believe pews promote a better, more organized traffic flow," he said. Other practical considerations impacting the choice of worship-area seating include configurability, capacity, and cost. Because of their linear nature, pews do not offer as many flexible layout options as theater seats. The semi-circular or tight-radiused arrangements possible with theater seats help create more intimacy and sense of community than pews can. While pews and theater seats offer comparable sightlines, theater seats can be offset from row to row, so you're not sitting directly in front of anyone else. It's not uncommon for churches to use a mixture of theater seating and pews, often installing pews in the back few rows. This decision has both aesthetic and practical benefits. "Some churches want to minimize the visual sensation that you're walking into a sea of theater seats," said Chegwidden. Pews can provide a more traditional look around the edge of the worship area, while also accommodating larger people who may not sit comfortably in a theater seat. Electricity and electronics are also impacting seating decisions. Wolfe sees more church projects today calling for aisle or directional lighting to help people navigate in low-light conditions; theater seats are usually better equipped than pews to accommodate this feature. The growing use of audio-visual projection in worship areas means that hymnals or other books are not used, so the book holder commonly piggy-backed behind or beneath a pew may not be necessary. Although it may be counterintuitive, theater seats offer greater seating capacity than pews for the same floor area. The main reason is row-width requirements. Fire codes specify the width between seating rows and how many aisles are necessary to ensure a safe and timely evacuation if necessary. Theater seats, with their spring-loaded seat pan that automatically folds up, create more inter-row space than fixed wooden pews. As a result, rows of theater seats can be closer together than pews and fewer aisles are required. With pews, it's also difficult to ensure each "seat" is occupied. People may not sit close to each other, someone may place a Bible or purse next to them, or a tired child may stretch out and occupy several places. With theater seating, however, you know with certainty that 2,000 chairs will actually hold 2,000 people. When calculating the seating capacity of different options, it's important to be realistic. The fire code may consider each 18" of pew a seat, but that figure is not practical from a human physiology standpoint. "Americans today have gotten bigger – and wider," said Wolfe, who adds that most adults require a minimum width of 21" to 24" or more. To evaluate seating options, be sure to involve a cross-section of your church's membership so the final decision best suits everyone. Wolfe recalls one church project where the tall, long-legged minister singlehandedly selected the pew size. He chose a deep-seated pew that was comfortable for him, without realizing that his selection meant many short people and children could not lean back if they wanted their legs to touch the floor! Along with considerations of comfort, the depth of the pew will impact the room's overall capacity. For cost comparisons, Chegwidden's rule of thumb says theater seats cost 2.5 times more than wooden pews. With any such major purchase, long-term factors, such as durability and maintenance, should be considered along with the initial price. "In seating, like most things, you get what you pay for," said Wolfe, who says pew construction and quality vary widely. Pews with upholstered seats and backs are cheaper than solid hardwood, but they often lack the internal fortitude to withstand years of heavy use. Upholstery may conceal particleboard or MDF plywood, which has a tendency to bend, flex, and deteriorate much faster than solid hardwood. Upholstery also doesn't age as gracefully as hardwood. Theater seat upholstery is also susceptible to damage, but it's easier to replace a single seat bottom or back if one gets ruined. "With theater seats, we always order an extra dozen backs and bottoms with the same fabric," explained Chegwidden. "This makes maintenance a little easier." On a per-seat basis, theater seats are generally more expensive than pews. However, costs can vary widely depending on the details, features, and quality of construction, including kind of wood. If you choose theater seats, ensure the true value of your investment by requesting a sample chair and inspecting it thoroughly. Listen carefully as different people try out the seat. How loud or quiet is the seat-return mechanism? Remember that the slightest chair noise will be multiplied – and amplified – in a large, open worship area. Manufacturers should subject their theater seats to independent testing following standards established by the Business and Institutional Furniture Manufacturers Association (BIFMA). These tests measure a seat's strength and stability, while ensuring they can withstand heavy, repeated use. If the manufacturer doesn't offer this test data, ask for it. While seating for the main worship area is a primary focus, multi-use spaces also have specialized seating requirements that should be considered. Comfortable chairs will offer the most flexibility, because their use will easily stretch for multiple events. "Metal folding chairs quickly become uncomfortable, particularly for older people," said Wolfe, who recommends churches select chairs with firm cushions and a comfortable seat pan and back. Poorly designed, ill-fitting chairs can inhibit blood circulation to the legs. 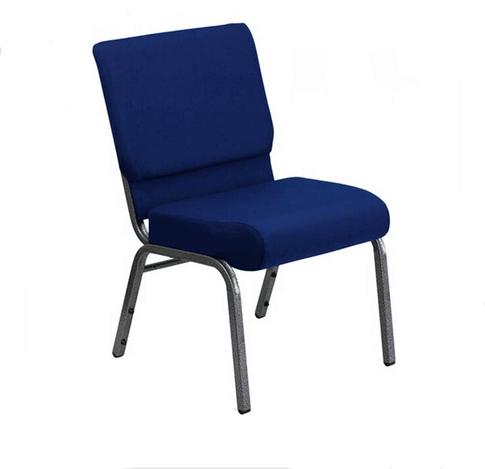 In temporary or interim worship spaces, portable audience chairs can offer the padded comfort of permanent theater seating with the added benefit of flexibility and portability. Designed for flat floors, they can be permanently installed later if necessary. High-density, deluxe folding chairs offer more affordable comfort when budgets are limited. These chairs, often used in arenas for floor-level concert seating, also require significantly less storage space. If your church facility includes rooms that serve double duty – such as music rehearsal and religious education or conferences – consider the flexibility and support of specialized music posture chairs with tablet arms. For any temporary, flexible seating, Wolfe advises that fire codes usually require chairs to gang together because this provides more stability and safety in the event of an evacuation. While the seating decisions your church makes will not have eternal consequences, they will certainly have important, long-term implications in the areas of comfort, flexibility, and wise stewardship of your resources. To ensure the best results, be sure to judge all seating options carefully.